Hammerfell Imports brings to you two redguard pedlars doing the merchant route between Hammerfell and Skyrim, mounted in their camels, selling more than 200 new items, such as new weapons, clothes, foods, shields, potions, drinks, books, decoration, etc., from their warm homeland. 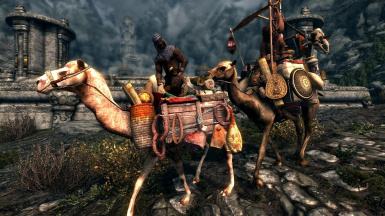 Hammerfell Imports brings to you two redguard pedlars doing the merchant route between Hammerfell and Skyrim, mounted in their camels, selling weapons, clothes, foods, shields, potions, drinks, books, decoration, etc., from their warm homeland. 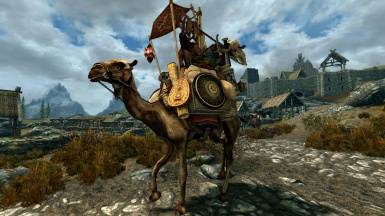 The pedlar that rides a Camel does the route between Markarth and Whiterun, and the Dromedary rider sells things between Markarth and Ivarstead. Sometimes both walk together side by side on their mounts for all the reach roads and whiterun tundra, untill one keeps his path into the rift. But that is not much common, commonly the pedlars and their mounts travel alone. 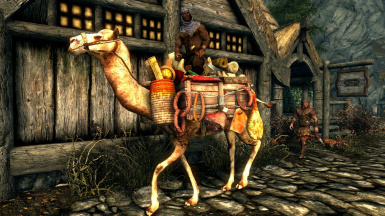 They have a good amount of money (10 k), what make them interesting merchants to sell things to them, on your travels. 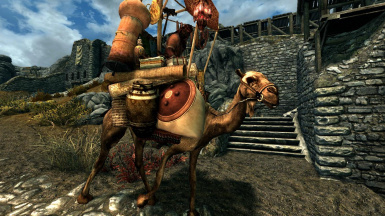 They are a big source of items from Hammerfell (+200), including 18 new weapons (bow, axes and specially curved swords), 8 new shields (heavy and light), 11 clothes (nothing very special here cus i will release soon a redguard camp and there you will find new clothes and armor), 1 ingredient, 42 new foods (including the concept of full meal, when you buy a complete meal of vegetables, meat, etc, and not piece by piece), 5 new potions, 1 new spell (now adrenaline rush can be casted as alteration school spell), 2 new books and 132 new decorative items such as pillows, creates, jars, vases, urns, lanterns, incensers, and much more. (this as perfect to decorate your home or camp, specially if you have mods that help you to move and place items in the game in a more smoothy way). Both pedlars and both mounts are essential, and you can steal them from the pedlars, but this is not good at all. 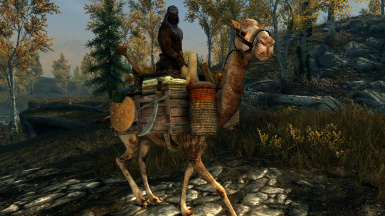 Wait cus i will release both as mounts (summonable and pack variants) soon on the redguard camp i will release as ive told you above on the text.